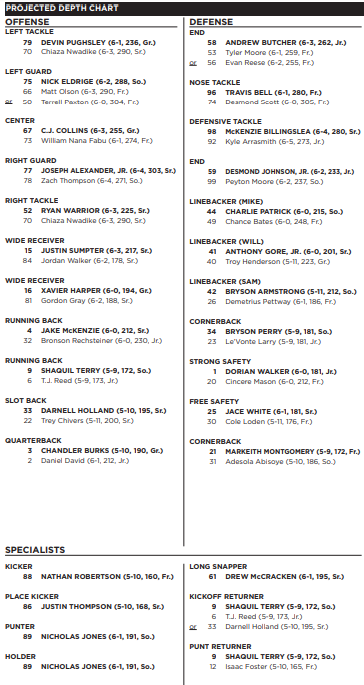 Before I give my thoughts – let me say that I am aware that a Week 1 depth chart is not something to live or die by. It is fluid and subject to change each week based on performances in each game and injuries. With that being said, with the game 48 hours away, it is fun to take a look at the material we have to work with at the moment, and see how things progress as the weeks go on. 14 freshmen are listed on the 2 deep. 6 are true freshmen. 2 will be starting (NT Travis Bell & CB Markeith Montgomery). Well, 3 are starting, if you count Nathan Robertson on kickoffs. In a new rule which will make things more exciting and fair for younger players and injured players, players can now play up to 4 games in a season without burning a year of eligibility. For this reason alone, we might see a few more guys than usual. Coach Bohannon explained in his press conference that the 2nd recruiting class consisted of a lot of transfers to help make a more immediate impact. Now that those guys are gone, there is a bit of a gap that the freshmen and redshirt freshmen will need to fill, so we will see more young faces than we are used to (especially on defense). Graduate student Devin Pughsley, who played the last 3 years on the DL, has shifted to first string left tackle for his final season. Ryan Warrior who has held that spot down for 2 years, will shift to right tackle and start there. Veteran Chiaza Nwadike will backup both spots. Nick Eldridge will start at LG with Joe Alexander at RG. No surprises here based on last year’s play. Eldridge is backed up by both Matt Olson and Terrell Paxton. Olson is a PWO freshman – definitely a pleasant surprise there, and at 290 pounds, he looks the part. True freshman Paxton’s older brother is Georgia State’s center and I believe another one of his older brothers graduated from Georgia State. C.J. Collins is starting at center. No surprise there – he’s an FCS All-American. He’ll be backed up by William Nana Fabu – Collins’ heir apparent in 2019. Familiar faces Justin Sumpter and Xavier Harper will be starting at WR. Gordon Gray and Jordan Walker, two “Original Gangstas”, will be the backups at WR. Look for Gray and Walker to be pushed by R-So. Dorian Miles as the season goes on. Jake McKenzie will be the starting B-back, which is absolutely no surprise to anybody. Bronson Rechsteiner is listed as 2nd team there, but I am very confident Sam Outlaw will also get his fair share of reps throughout the year. The slot back spots all go to the returning players with Shaq Terry and Darnell Holland being the starters and Trey Chivers and TJ Reed as reserves. I’m curious to see what names sneak in that rotation for snaps since we do have more depth than past years. All Conference, All League, All FCS QB Chandler Burks will obviously be starting. It looks like Daniel David has fended off Tommy Bryant for the backup spot. David is a very gifted player who needs to prove he can cut it in the triple option offense. Keep an eye on David and Bryant when they do get snaps, because the odds say that you’ll be watching next year’s starter. Tennessee transfer Andrew Butcher has won the DE battle. There were questions about if his football career was finished prior to transferring to Kennesaw State. Good to see that he’s back and apparently healthy! He will be backed up by true freshman Tyler Moore and redshirt freshman Evan Reese. Keep an eye on Reese after having a year to grow in practice. Redshirt freshman Travis Bell will be starting at NT at 280 pounds because Big Z has suffered an injury (lower leg/foot) and I fear that it’s pretty serious. The good news is that I think Travis can be a wrecking ball for the Owls and if he plays like I expect, he probably would start on most FCS teams. He will be backed up by true freshman Desmond Scott at 305 pounds. Cobb County product McKenzie Billingslea is starting at defensive tackle – he has developed drastically since year 1 and I would say he’s an underrated star of the defense. I look for him to be even better this season and get the recognition he deserves. Desmond Johnson keeps his starting spot at rush end, which is no surprise. Peyton Moore gets his backup spot again. He’s a Georgia State transfer and I’m sure he’s going to make the most out of his snaps on Thursday. Speaking of making the most out of their snaps Thursday…Charlie Patrick will be taking Izzy Sam’s spot at Mike backer. Patrick is also a Georgia State transfer. He will be backed up by Chance Bates, a true freshman who can really run and hit. Anthony Gore Jr. will be backed up at the Will Backer by Troy Henderson, a transfer from Syracuse. I love the depth at the LB spots. Super Sophomore Bryson Armstrong returns at the Sam Backer spot. He’ll be backed up by redshirt freshman Demetrius Pettway. Sophomore Bryson Perry will be starting at one of the cornerback spots. He initially committed to Army but came out of nowhere to get his first-string nod for the Owls. He will be backed up by Le’Vonte Larry, a 1st team JUCO All-American. Georgia Tech transfer Dorian Walker has shifted over to safety in his 2nd year with KSU. He’ll be backed up by Cincere Mason, an exciting young redshirt freshman from Atlanta. Original Gangsta Jace White returns at free safety, and in a bit of a surprise, he is backed up by redshirt freshman PWO Cole Loden. Markeith Montgomery takes the other starting CB spot. He was widely regarded as the most game ready player in the Owls 2018 Class, so it’s a good sign that he is starting. He’ll be backed up by Adesola Abisoye, who missed the latter part of last season with an injury. Justin Thompson will return at Place Kicker, with Nicholas Jones taking sole possession of punting duties following the departure of Christian Kinsley. Jones will also be the holder. Nathan Robertson will inherit the kickoff duties from former Owl Jordan Genovese. Drew McCracken returns for his senior year at long snapper. If we never have to hear his name again for the next 5 months, it’ll be a good season for him. Fun note: His dad is a Chiropractor and his last name is McCracken. Shaq Terry is listed as the starting kick returner, backed up by TJ Reed and Darnell Holland. Taking over for Bert Birdsall at PR is Shaq Terry, who is backed up by redshirt freshman Isaac Foster. Coach Bohannon emphasized ball control over playmaking ability for this position. Previous story Pregame Thoughts…Is the Game More Important for GSU or KSU?